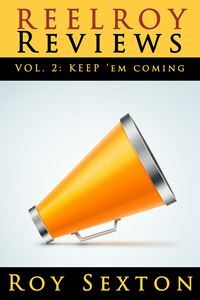 Just 7 days left until the official release of ReelRoyReviews, a book of film, music, and theatre reviews, by Roy Sexton! and when i get yours, i’ll need that third autograph to complete my ‘sexton section’ on my bookshelf. god, i’d better get a carpenter. and turnabout is fair play when you publish your book(s)! I dearly love this quote in this piece! we had to live it to believe it, eh? 😉 we are GLADIATORS to have survived! beth’s comments are WONDERFUL BTW! love that girl named beth!!! yep, our cat took the pictures…from his location in the sink if you noticed!!! =^..^= <3!!! love that! I noticed the kitty in the background and wondered if he helped! !